Radiologists face a gamut of industry and legislative developments that challenge their hospital relationships and their managed care reimbursement agreements and the fierce imaging center competition that comes with them. 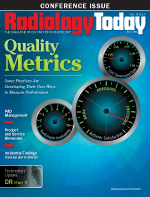 Along with rising health care costs and declining reimbursements, radiology administrators are encountering new obstacles as they witness changes and maturation in digital technology. It’s becoming increasingly more important to obtain timely information, presented visually, and to provide usability throughout the entire organization. In addition, drilling down into practice data to discover more detailed information in an ad hoc manner is critical to empowering radiologists in the decision-making process. While monitoring and managing day-to-day operations of a radiology department, such as workflow, throughput, report turnaround times, or exam volume, remain vital to quality improvement, the importance of them is still often provided via retrospective static reporting. A key challenge facing radiologists will be transitioning away from the comfort of familiar static (and stale) tabular reporting into the new world of real-time interactive dashboards that perform complex analysis and visualizations all day, every day. There’s no doubt that health care technology for business is advancing rapidly. Business intelligence dashboards, known as executive information systems, were born roughly four decades ago in health care. These systems had a basic foundation that centered on condensing data, typically revolving around an industry’s key performance indicators, into a single-screen form for high-level decision making. The static interface and nonintegrated usability were drawbacks to these prehistoric dashboards, and their inability to help with executives’ rapid decision-making needs led to their eventual demise. Interactive dashboards were the next development, created out of executive information systems’ shortcomings. These more advanced dashboards offered the benefits of enhanced visuals and usability, which empowered physicians at different levels with greater decision-making tools. The technology has evolved today, with the ability to stream and integrate information from various health care systems by consolidating the data into warehouses that can be accessed and manipulated to create valuable information and powerful dashboards. In other words, the history of executive information systems and interactive dashboard systems has paved the way for today’s dashboard applications, which are visual and rich in information and can provide rapid access to real-time information. The functional features in dashboards can package information needed for short- and long-term decision making into graphs, charts, tables, dials, and other formats. This provides physicians and managers with a keener understanding of their practices’ business side and trends. With detailed summaries and data analysis, physicians receive their electronic information rapidly throughout the entire organization. Key performance indicators, which serve as benchmarks for data aggregation and analysis, are critical pieces of business intelligence. However, simply setting them isn’t enough. Practices should focus on setting realistic and achievable goals while making a point to review frequently to ensure they’re still accurate. Inaccurate or outdated key performance indicators can do more damage to a practice than simply not having them set in the first place, since users can become numb to the constant variances and discrepancies and be less likely to spot an actual issue when one arises. Advanced functional capabilities also are important. These capabilities include the ability to drill down into the details, save custom views and settings, allow for commenting and collaboration inside the tool, and access to historical financial reports. Radiologists who can see graphical and numerical trending across their practice, with the ability to rapidly filter and sort the information, can get a big picture view of what decisions must be made. These capabilities also impact integration with other facilities and systems, including mission-critical RIS and scheduling systems. In conclusion, advanced dashboard applications are one of the biggest weapons radiologists have against rising health care costs and declining reimbursements. These dashboards should reflect a practice’s unique business strategies and meet its varying and individual needs. While visually pleasing graphics and flashy dials may be a draw, practices should make sure they trust the information being presented and ask themselves what empowers them to make timely decisions to ensure long-term financial success.